Perish the thought that I be defined by some of the home furnishings Ive owned over the years. If so, call me cheap, used, stained and sagging in the seat cushions. 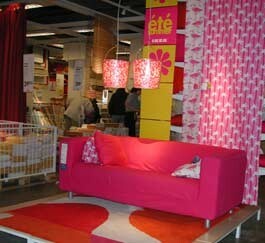 But lately IKEA has been cropping up everywhere I turn. A furnished apartment my partner and I rented in Hungary last fall was stocked  from shower rod to throw rug  entirely with products from IKEA. I recently read about free weekend busses from Manhattan to the stores branch in New Jersey. And after we set up temporary residence in Montréal, Vermont acquaintances who came up just to shop at the local IKEA were shocked to learn we hadnt been yet. Since its inception in the woods of southern Sweden more than 50 years ago, IKEA has grown into a global giant, with some 160 stores in 30 countries. It was time I found out what all the fuss was about. But first, I had to find it. Like most behemoth stores, Montréals IKEA is located in a highway wasteland outside the city. Once you happen upon Cavendish Boulevard, however, the vast blue building with IKEA stamped on it in huge yellow letters is hard to miss. Marching towards the towering golden entrance, in step with the purposeful hordes, I felt curiously as if I were on a pilgrimage. Not to overdo the religious analogy, but there are certain principles of belief IKEA holds dear, and self-reliance is the first to greet you when you enter. Beneath welcome signs  in French, English and Swedish  are information pamphlets directing you on your path and pencils for keeping track of your buying desires. Human clerks are available, but only as a last resort. Customers are encouraged to make themselves at home in the realistic room settings  the idea being to gather inspiration for your own home décor as you poke through completely decorated kitchens, living rooms, bedrooms and baths. As inspirations turn into purchasing decisions, you fill out a shopping list so that selected merchandise can be retrieved later on  at a location that depends on the items tag color. Additionally, there are yellow bags into which you can load certain items, presumably those that are smaller than, say, a sofa. As someone whos been overwhelmed by the minimal do-it-yourself requirements of Service Merchandise, I found the whole system disconcerting. At least there was little fear of getting lost. Unlike at most stores, where shoppers are set loose to roam willy-nilly, at IKEA arrows on the floor keep shoppers proceeding as an orderly herd. Those who insist on straying can take designated shortcuts. Most people  with the exception of some unruly children racing around with designer colanders on their heads  seemed content to follow the pack. Its just one of IKEAs many intriguing contradictions: The customer is encouraged to do it him or herself, but invisible others choreograph nearly every turn. Moving through the showroom, I had the odd sense of being simultaneously in a Swed-ish furnishings museum and in a Swedish strangers house. On the one hand, you can curl up in a living-room chair with one of the many Swedish books on display  if you happen to read Swedish. Or, if you prefer, you can snoop through one of the bathroom medicine cabinets, which contain real health and beauty aids. On the other hand, the realism does have its limits. The bathrooms, for instance, lack toilets, lest anyone be tempted to make him or herself too much at home. I nearly tripped over a woman who was changing her childs diaper on the floor of a realistic babys bedroom rather than in the real washroom with its designated baby-changing area. Most of the furnishings themselves look sleekly Scan-dinavian: lots of clean lines, blond wood, frosted glass and tastefully muted fabrics. The shoe racks are ingeniously practical, the storage units niftily compartmentalized. For the decoratively daring, there are funky furnishings, too: a chair covered with neon-green fur; another chair lit from within; highly sculptural lamps; a suede fringed carpet; and other rugs that look like refugees from a Twister party. Its not the Ethan Allen-style furnishings many of us grew up with  and perhaps this is one reason why its so popular with the young. Another part of its youth appeal, undoubtedly the main one, is that everything is unbelievably cheap. Its easy to see why the place is such a hit with folks who need to fill space fast for as little as possible. When IKEA began designing its own wares back in the 1950s, it was mainly thinking in terms of economical, flat packaging. But it also uses design as a selling tool. Products are named after designers, and designer portraits  with quotes about artistic intentions  dangle above some of the more novel objects theyve created. Upon learning that James Irvine wanted to create the kind of chair which, when you sit in it, you say, Ahhh and sip your gin and tonic, I, for one, craved a cocktail. But Monika Mulders wish for her design  to have a certain dynamic, as if its going to run away  was somewhat less soothing. As we progressed through the dizzying array of linens, light fixtures, artwork, frames, curtains, candles, garden implements and much, much more, I detected a rising discontent among my shopping brethren. Herein lies another IKEA contradiction: the encouragement to purchase both frugally and gluttonously. Heres your chance to get everything youve always wanted, one more sign announces. But with thousands of seductively cheap products dancing before your eyes and closing time approaching, its hard to remember who you are, much less what you wanted. IKEAs success surely depends on its customers going home with things they never knew they wanted. Rushing through the cavernous self-serve warehouse towards, we prayed, the checkout, we witnessed the results of all those full shopping lists. Customers who had actually managed to locate their flat but distinctly unwieldy packaging were struggling to stack their selections onto rolling carts. One couple bravely navigated a boat-sized sofa and armchair through the crowds. This was, I assumed, the noble perspiration portion of the IKEA shopping experience  the portion exalted in U.K. ads featuring IKEA co-workers sniffing one anothers armpits and learning that customer sweat is a very good thing indeed. For an added fee, IKEA does offer home delivery, as well as an assembly service. Since on my fun scale putting together my own furniture ranks right up there with do-it-myself surgery, I knew that if the situation presented itself, Id be tempted to partake of this morally derelict option. Fortunately, since our only purchase was a bag of 100 tea lights  no assembly required  we avoided the shame of self-insufficiency and glided through the express lane to IKEAs final stop: the Swedish shop. At this last destination, you can find all manner of gourmet delights to accompany your new furnishings, including those famous Swedish meatballs. Perusing the edible specialties in this corner of the megastore, its almost possible to believe that IKEA is a modest little ethnic store. A poetic ode to humble forest beginnings  including lines about moose sipping fresh water and lingonberries begging to be picked  encourages this perception. The illusion falls apart, though, when you consider that families in such far-flung locales as Montréal, Saudi Arabia and Malaysia can serve Swedish meatballs off identical dinnerware on identical dining tables under identical lamps. So, if youre truly looking for a dining set that uniquely defines you as a person, IKEA is probably not the place to find it. Their furnishings are now so ubiquitous, they could define pretty much anyone. Which may be another reason why theyre so popular. Perhaps most people have neither the budget nor the imaginative inclination to seek out personality-defining furnishings. When at last we reemerged, the load-it-yourself area looked like The Beverly Hillbillies run amuck. Mattresses were being strapped over windshields, children piled atop boxes. It wasnt pretty, and I guessed that the home-assembly process would be even less so. But this final ordeal wouldnt be a problem for us. We were free to head home, light several dozen tea lights, relax and enjoy that other, less demanding four-letter Swedish phenomenon: ABBA. Exhibit review: "Sense of the City"